So first there was spring break, and we took the mother-in-law to New York City for her 75th birthday. Then there was an academic conference, where I presented a paper. Then there was the week after that, which inexplicably left me off track for this project. The house is relatively clean, but the do-one-thing-every-day streak has been broken. Anyway, there’s nothing like starting over. Tomorrow, progress. Day 75: Decision-making time on electronics boxes. Having the original boxes for things like televisions and computer monitors is handy when you move, but not so awesome when you have to live with closets full of boxes. I moved a few into the attic — there’s room since I don’t store anything else in the attic. I still have a few more boxes scattered under the guest bed and in my office closet, but at least some of them are out of sight. Day 76: I needed to make room in the cabinet for my awesome new OXO angled measuring cup. I could have probably just squeezed it in, but I found it much more satisfying to toss out a few old jars and other miscellany. Day 70: Vacuumed the living room furniture. Even though I’ve discovered that Yin, who died back in September, was responsible for approximately 75 percent of the cat hair in the house despite his smaller stature, Yang’s still doing a great job of dusting the house with light gray fur. Saturday, Day 71: I finalized my ScanCafe order online. Thus ends to saga of the latest box of photos cleared out of the closet for digitization. Day 72: Sometimes, minor household emergencies lead unexpected organizational advances. I noticed a weird dark stain on the bottom of one of the pantry shelves; upon further investigation, I found that a can of Pam cooking spray had let loose and dribbled for no telling how long, leaving an oblong puddle on the shelf. I cleared everything off of the shelf, sopped up the puddle and sprinkled baking soda all over the stain to try to soak up some of the spray. After I vacuumed up the baking soda a few hours later and started putting things back, I rediscovered a dirty little secret of closet and cabinet organization: Once you’ve completely cleared out a space, it’s hard to fill it back up. I tossed a couple of bottles of miscellaneous spice blends that I had been gifted with a couple of years ago, along with some bouillon cubes that had expired in 2007 (although, you might ask yourself, can bouillon cubes ever really expire?) and a few other items. It’s pretty fulfilling, overall, to know exactly what’s on a pantry shelf. Day 73: Repeated Day 72’s pantry clean-out protocol with another pantry shelf. This take-no-prisoners organizational strategy is totally working for me. Day 74: Started prepping for the mother-in-law’s upcoming visit by purchasing duvet clips for the new duvet and duvet cover I found for the guest room last week. Anyway, it doesn’t really go with anything, but it doesn’t really NOT go with anything, either. It’s handmade and unique, and I love the stylized creatures that now brighten the upstairs hallway. Day 63: Made an epic find at Target. I was planning to buy a duvet and duvet cover for the guest bedroom, since I’ve found that combination imminently easier to care for than a comforter, bedspread or quilt. With the mother-in-law set to arrive later this month, it was finally time to ditch the cat-hair-laden comforter. Anyway, I found the EXACT items I was looking for in the clearance section for half price. Woot! Day 64: Attempted, yet again, to move the garage shelf, only to find that there was a HUGE, unwieldy pile of green wire for the robotic mower blocking the way. I spent a good 30 minutes untangling the wire and wrapping it around an empty paper towel tube. Can it be unwrapped easily without retangling itself? I don’t care. Day 66: Finally managed to move the garage shelf into its new place without getting hit in the head with the surfboard again or finding another tragic tangle of green wire. Day 67: Cleared a few things out of the kitchen pantry, including a canister of breadcrumbs that expired in April 2010. It’s rather amazing how things accumulate so quickly in there. Days 68 and 69: I spent these two days driving to Nashville, hanging out with my brother at work and then hanging out while he had knee surgery, and then driving back. 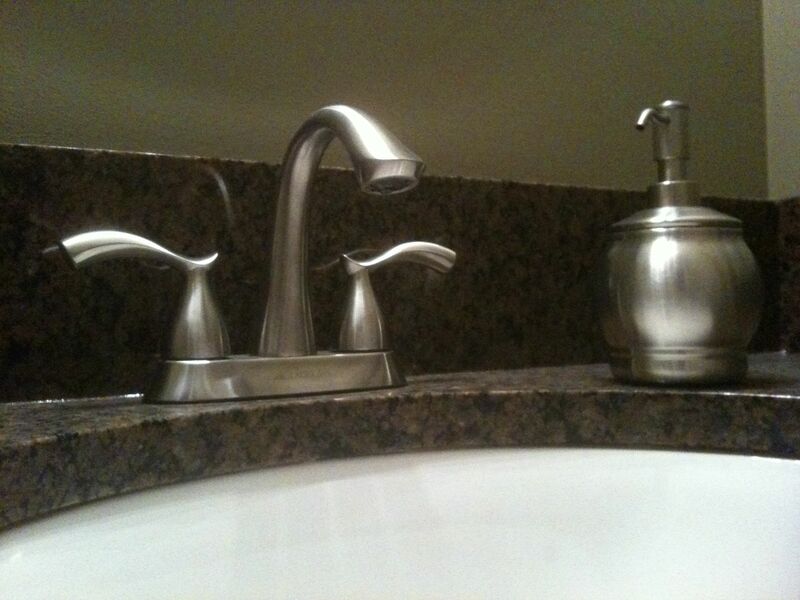 Family trumps home improvement, every time. Day 63: I feel weird that purchasing a soap dispenser at Target makes me so happy, but I’m also sort of glad that something so simple and inexpensive can make my day. It’s complicated. Day 62: I think we all saw this coming. 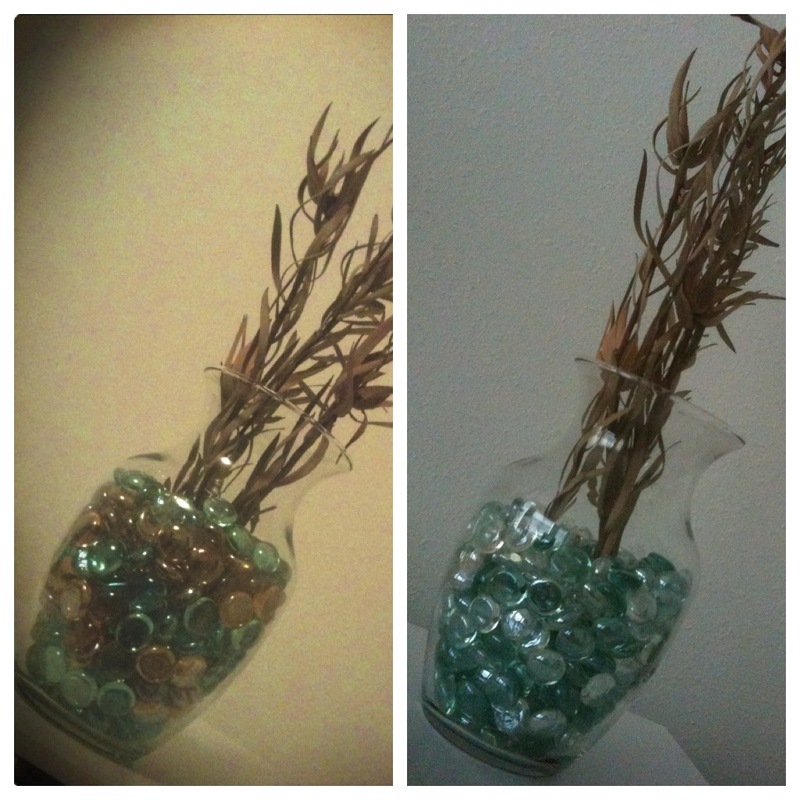 I decided that, indeed, I hated the vase/glass pebble look I put together recently. The brown pebbles seemed to be the biggest part of the problem, so I ditched them (hopefully, some lucky shopper at the New Leash on Life Market Place has more love for brown than I do) and replaced most of them with some clear pebbles that were hanging out in the garage. It’s still not one of My Favorite Things, but it’s definitely making me happier. Day 56: Planned to move a small shelving unit to a more effective place in the garage. Got hit in the head with an errant surfboard. Yes, a surfboard. 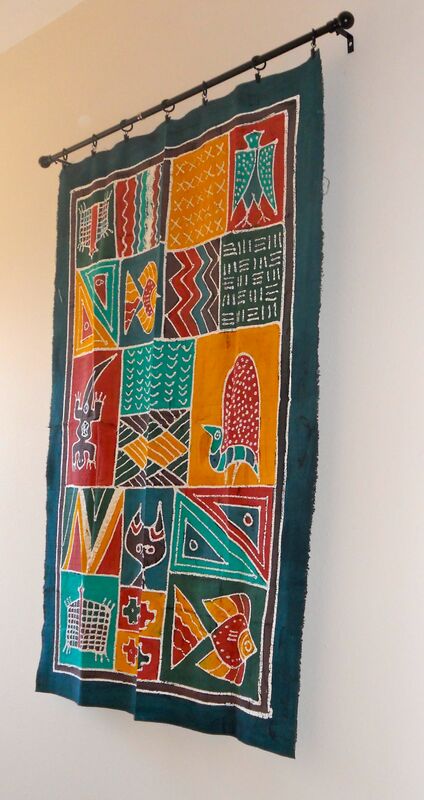 Day 57: Got the husband to help me pick a spot for the wall hanging, since he’s the one who brought it home as part of a package deal when he bought a Volkswagen bus. We didn’t get to hang it, however, since the neighbor’s dog barked from literally 7 a.m. until we fled the house at around 2 to seek peace and quiet in the movie theater. Day 58: Hung the toilet paper roller AND the towel holder in the downstairs bathroom. Epic. Day 59: Tossed a pile of recipes that I had cut out from newspapers and magazines. It seems like all people who like to cook have one of these piles of recipes that they go through a couple of times a year, yet never manage to pull anything out and actually make it. Not anymore. They’re in the recycling guy’s hands now. Day 60: Swept out the garage, or at least the parts I could get to with a broom. Day 61: Nada. I did schoolwork and worried about my mom and her sick dog. Day 51: Still recovering, but I did manage to help the husband a little as he hooked up the drain pipe in the downstairs bathroom. Day 52: The problem with hidden, built-in storage is that you store stuff in it and then forget all about it. Sometime before Christmas, I had stashed some paperwork in the piano bench while doing a quick pre-guest pickup in the living room. I remembered the paperwork only last week, when I went crazy trying to find a form that, oddly, I hadn’t seen since before Christmas. Today, I got most of the stash out of the bench and filed it away upstairs. Day 53: I have a unique wall hanging that I’ll write more about later, but today I did an epic amount of research on the best way to hang it, since right now it’s just a folded piece of fabric in the closet. I’ve come to a final decision, and it doesn’t involve going back to the seamstress that made me feel bad for not knowing what kind of seam allowance I wanted. Day 54: Admittedly, I spent what little organizational time I had today coloring paper balloon cutouts for a failed cat photo shoot. Day 55: I finally redeemed a Groupon I purchased in December for a 16-by-20-inch gallery wrap from Canvas on Demand. I had narrowed my choices down to two photographs when I discovered that the site offered personalized customer service interaction that helped me choose the winner. Now I’ve got two weeks to decide where to hang it.